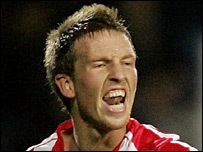 Boss John Toshack has recalled Danny Collins to the Wales squad after accepting an apology from the defender. Collins, 26, rowed with Toshack after the goalless friendly with Paraguay last March, when the Sunderland player had been left on the bench. But Collins, capped four times, has been recalled for the Belfast friendly against Northern Ireland on 6 February. "Danny contacted me and said he'd been hasty, he regretted it and what he'd said had been a mistake," Toshack said. "Danny was very disappointed after the Paraguay game when (Lewin) Nyatanga made his debut, and he relayed that disappointment to me. "He told me he didn't want to play for Wales again while I was manager, so I haven't picked him since. "But after we played Liechtenstein in November he contacted me. "I told him that I would consider him in the future, and that is what I have done. I felt that it was time to give Danny Collins another chance. "There's no promises, but he maybe saw that we had the likes of Steve Evans and Craig Morgan in the squad and that he should be there too." With West Ham pair James Collins and Danny Gabbidon injured, Wrexham centre-back Evans retains his place in the squad while Peterborough's Morgan is also included. Toshack has also had high-profile rows with Premiership pair Robbie Savage and Ben Thatcher who both remain in the international wilderness, although Savage suffered a broken leg this week. But with Collins returning, Toshack has proved he is prepared to forgive and forget if the apology is heart-felt enough. "Now we are without key defenders James Collins, Danny Gabbidon and Mark Delaney, who are all injured," Toshack added. "So although Evans and Morgan have been included again, I felt that it was time to give him (Collins) another chance." Toshack has also called in Wycombe striker Jermaine Easter for the first time. But Blackburn goalkeeper Jason Brown has been left out, seemingly because he is not playing first-team football at Ewood Park.